The banquet stilled. People spluttered, choking and dropping their goblets while she observed serenely from her unmoved seat, sipping wine. The people at the table were dying. The men fell forward, drowsy, and drowned in their soup. It was worse for the women. She’d put much more nightshade in theirs. Trusting fools. Why leave a witch in the kitchen? The hall was silent save for his strained shout. Soft lips smiled at him. “I stopped them trying to take you away.” An enchanted chain curled into place around his wrist. Are your sins this constricting…? Chilling. Just the phrase "It was worse for the women. "… Wow! You have just the right level of detail in this in my opinion. Another interesting look more at the result of the sin than the sin itself, and the eyes in that image are just haunting. Interesting. Who's she envying? The people at the banquet who had his attention? What an evil witch you've got there! Scary. Reminds me my first live-roleplay, there was a very jealous evil elf queen and a cursed ring. 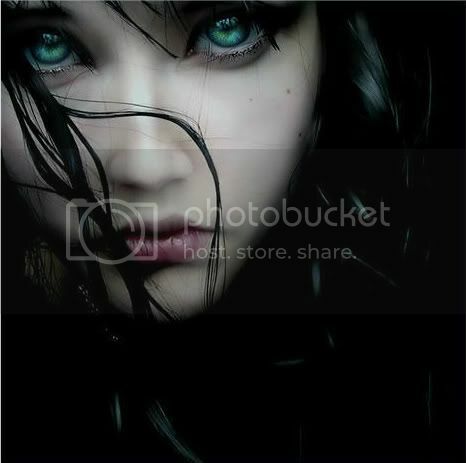 The image fit's well, specially the green eyes are hauting. That picture is absolutely haunting! Goes well with your magnificent words. This was just darn spooky. You caught the ends of one reader's nerves. Bingo. I like to choose images that I feel fit with whatever I'm writing and I'm really glad that this one did its job so well. Thank you for all of your lovely comments. I was aiming for a possessive kind of obsession where she couldn't stand to have anyone else near him in case they tried to steal him from her. Good and evil use of envy. Sent a little shiver down my spine.